Cook Custom Homes was featured in a Calgary Sun Homes & Condos exposé describing the Pinkshield Mould and Moisture protection that comes standard with all Cook Construction projects. 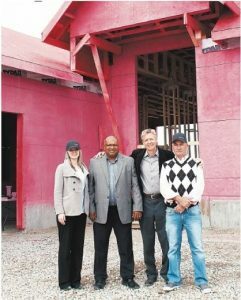 This article not only identified the shocking pink custom home under construction in Watermark at Bearspaw, since completed (it’s the The Stratford), but highlighted Cook Custom Homes’ exceptional standards for top quality, long-lasting building materials and techniques, even when they’re unseen in the finished luxury home. CALGARY, AB – It’s hard to miss: When you drive into the new community of Watermark in Bearspaw, just on the outside of Calgary’s northwest corner, the first thing you see is the Cook Custom Home under construction. The most eye-catching element of the newly framed bungalow? The deep pink hue coating on the outside. Teaming up with Timber-Tech Truss Inc. and PinkWood Ltd., Cook Custom Homes is offering greater protection to homeowners against mould, moisture and fire. “Cook Custom Homes sprayed their showhome in Watermark with Pinkshield Mould and Moisture protection,” says Blair Nutting, vice-president of sales and marketing with PinkWood.